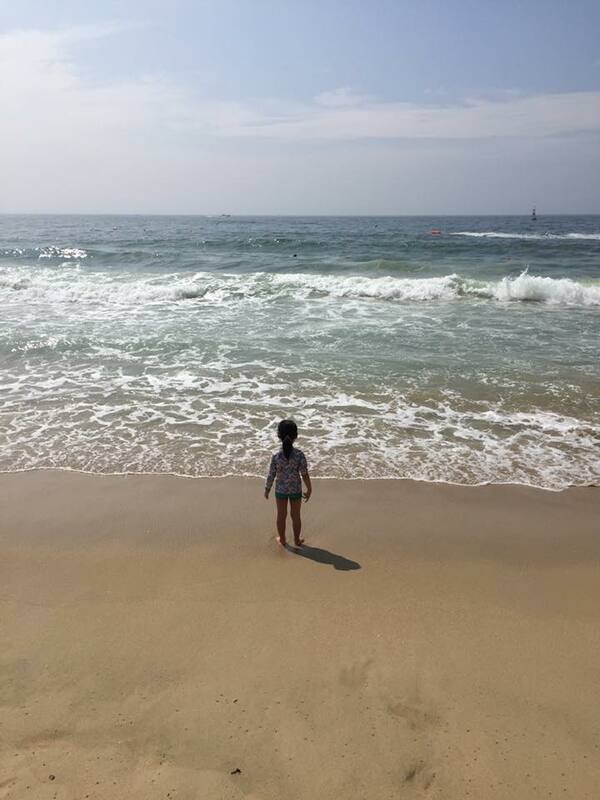 I first started this blog in 2006, right before I arrived in South Korea. Over the subsequent years, it became an enjoyable experience for me to post my photos up and add a few wayward comments. As an expat settling down in a new country, I think it was a helpful tool for me to reflect on and understand my new environment. I've since survived a PhD, gotten married to a wonderful wife and had two wonderful kids. 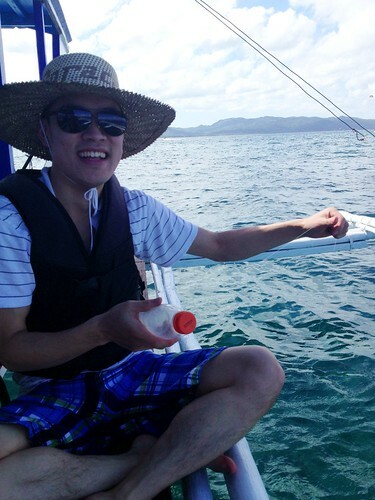 In 2013, I joined a Korean pharmaceutical company and have been pretty flat out since. But somewhere in the back of my mind, I've felt a little guilty about not blogging more often. There are two reasons why I haven't kept up with blogging over the past couple of years. 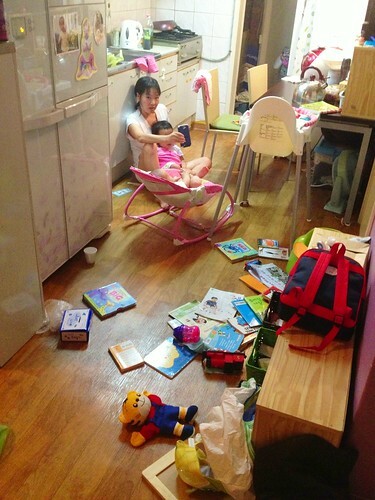 The first is that my kids have become a central feature in daily life, and free time has been in short supply. The second is that I've felt less compulsion to blog, perhaps not just due to a lack of time, but also because I've become extremely familiar with this country that I now feel is truly my second home. While my readership has always been small, I greatly appreciated the helpful comments over the years from you all, and especially the messages of support and congratulations during the big events. We made the decision last December to move back to my hometown of Adelaide, Australia, in order to raise our kids there. We're actually departing in a few hours from now, so this is my final post here in Korea on my final day in the country. We'll be back for visits, of course. I would like to thank you all for reading this blog over the past decade, and hope it provided some amount of amusement or useful information. I hope to post one final time after we settle back home in Adelaide to provide you with an update. Many thanks all, and best wishes. Every once in a while, the Koryo Peninsula Farrands will venture out to rice paddies beyond the comfortably familiar, and embark on a road trip to imbibe new sights, sounds and smells. Many months ago, one such journey took us to an innocuous little island that we shall call Anmyeondo. I had been there many years ago, together with an entourage of adoptees on a government-sponsored program to wreak havoc on the motherland. 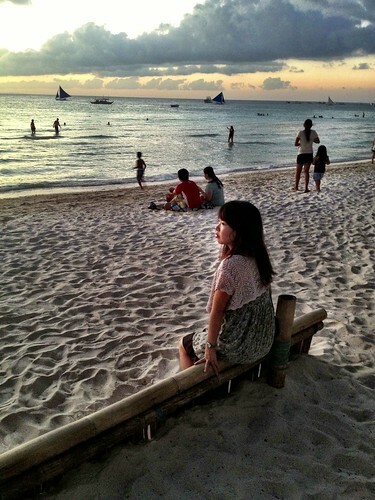 I have vague memories of fine sunsets, warm nights, and noraebang. And so it came to pass that I triumphantly returned, this time accompanied by wife and offspring. We came by way of a then-new Farrand Mobile, which held up remarkably well along a series of meandering roads that to our muted dismay would become decreasingly less road-like. Baengy took the opportunity out west to inspect a solar panel farm. "A respectable conglomeration of photovoltaic systems," remarked she. If tidal pools, stones and mud were alone responsible for making places famous, Anmyeondo would be far better known than it is today. As it turned out though, we weren't the only pool-stone-mud admirers in the neighbourhood. This photo of Baengy reminds me of the Spirit Rover, trekking across the windswept rocky plains of Mars. Although Anmyeondo was a little less exotic than the Red Planet. Photos are not the best devices to depict wind, but it was quite a windy day. Our daughter's gleeful reaction in the photo above was her response to the force of the gusts, which were enough to wave her hands around. And those little cauliflower-like patterns in the sand were produced by sandworms. Quite possibly distant ancestors to the Sarlacc. 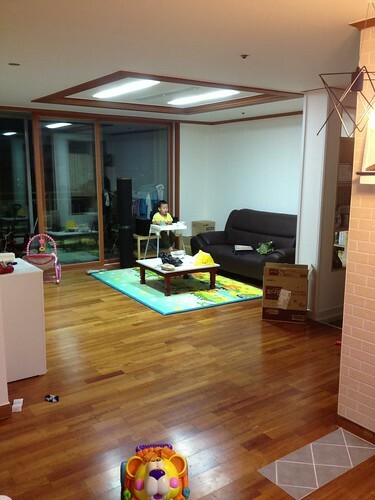 Baengy is the pale yellow dot in this photo, appearing like a mote of dust suspended on a sunbeam. We recalled her back to basecamp shortly thereafter and encapsulated her in a cosmic biosuit to protect her from the elements. The next steps of the Spirit Rover came timidly at first, but then with higher frequency and rising confidence. Like the pitter-patter of introductory raindrops before the monsoonal downpour. Baengy and I soon realised that we had no time to waste in constructing a sand berm, if we were to stand a chance at protecting our matriarch and precious larva from the unforgiving winds. Precious larva seemed suitably impressed with the fortifications. But then again, precious larva is easily impressed in general. If you tickle his toes, you've made a friend for life. No praise is too high for the efforts of Super Mum, the stalwart mothership who even managed to recapture the rebellious Spirit Rover after it failed to obey commands to return to base. Those commands were transmitted over numerous audio channels and even received a visual acknowledgement of receipt. Suffice to say, Spirit Rover can be quite mischievous at times. It wasn't long before the sun set on our voyage west. 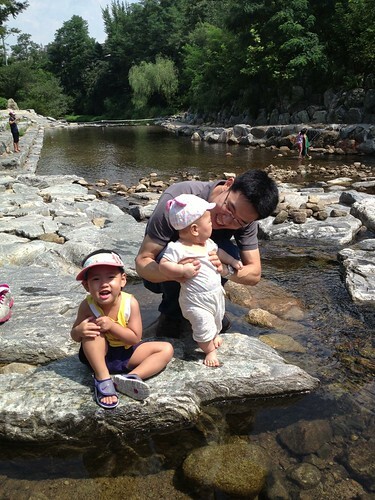 Anmyeondo is recommendable if you like solitude, windy beaches, and unremarkable geological features. We had a good time overall, but mainly due to the family travel factor. The west of Korea is not unlike the east, but with more tidal action. If you're in Korea and looking for a nice road trip, I'd say that the south-west of the country (Haenam) is probably a better bet. I'll make a post on that, sometime soon. How much does a polar bear weigh? Enough to break the ice. Hi, my name is Lee. Time. Energy. Access to a computer. When these three entities are in temporal alignment, a celestial event referred to as a Blog Posting can occur. Such events happened with greater frequency in times past, but two hyperspace anomalies recently supervening in our quadrant have been sucking all resources and material toward their gaping maws, wreaking general havoc on all that was once good and peaceful in the galaxy. Their names are Ashley and Alex. Since last posting, much has happened in the world of the Farrand family. No news is good news, as they say. We continue to do very well, despite having neglected my old friend The Blog, who at one time dearly comforted my ego as a friend in whom I could reliably confide. But I can say that I've recently bought an iPhone 6, and no longer have photo storage issues. A veritable catacomb of myriad orifices may be a good way to describe the daunting labyrinth of unposted photos residing in my desktop image folders. So what I'll do is post about past events incongruently, and imagine the software-based forensic historians of the future can patch up any inconsistencies, should they care. I'm of the persuasion that anything we publish online these days has no reason to find itself deleted, save for deliberate action. The reason being that although what we say is of only minute historical significance, the economy of modern memory technology effectively renders deletion a needless activity. I was recruited by a Korean pharmaceutical company after graduating from SNU in August 2013. The job was lined up from February 2013 due to a lucky mix of contacts and a man called Anthony Nguyen, who serendipitously introduced me to my current boss on the sidelines of a symposium. And I must say, it's one of the best things in life that has happened to me. Apart from growing up in Australia, moving to Korea, marrying my wife and having kids. My company, which will remain nameless for search purposes, is an excellent place to work. Sure, the working culture has it's own differences and peculiarities, but nothing is a match for the insanity of Korean graduate school. Having spent more than four years within the immalleable bureaucracy of the SNU machine, nothing is too much for my now experience-hardened and immutable patience. The work is stimulating, but most importantly, the people I work with are people I like and respect. They make me want to work harder. Although I'm the only foreigner in our company (of 1,500 employees), and despite my sketchy Korean skills, I've never once been made to feel sidelined because of it. 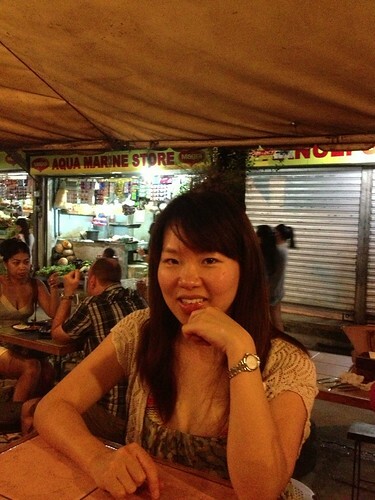 I have a variety of duties including business development, communication with overseas parties and medical writing. I also spend some of my time doing cancer screening experiments in the labs. Each week brings something new and interesting. An oddity I've observed at this company is that normal work statistics do not seem to apply. My previous formulation of Lee's Law states that, "For every 10 researchers that exist, at least one will be difficult to get along with." This does not seem to hold true for my current company, as I've yet to identify a difficult person. There could, however, be a secret enclave of difficult people all working together in a unit of the company somewhere, whom I have yet to meet. This would fulfill the requirements of Lee's Law, statistically speaking. These two gentlemen are both directors in my unit, called the R&D Strategic Planning and Operation Unit. We three went hiking soon after my induction, and ended up walking about 13 km, stopping to drink makkeoli at a cemetery and eating pajeon on the way home. Nothing is better for bonding than talking about the intricacies of work politics while tipsy in a cemetery. I started an English conversation club that's held during Wednesday lunchtimes, which has continued for a year now. It's been a good way to make new friends, and the company has been kind enough to support us with a dinner budget to celebrate every six months. I joined the company with a group of new employees, and we've bonded well as dongi (fellow inductees). 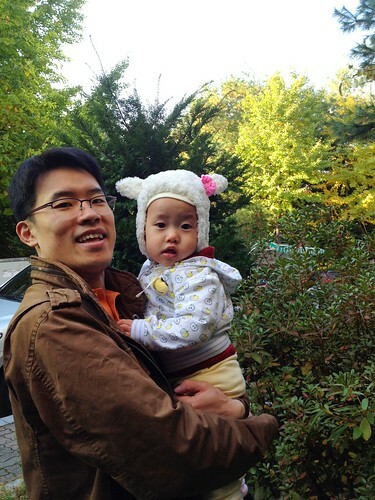 We had a housewarming party at our new apartment, and one of my colleagues brought his two daughters over as well. I like it when guests play with my kids. And then there are the company 회식, or work dinners, which are an integral part of Korean corporate culture. At these mythical events, one is expected to get tipsy and become more frank with others, thereby serving an important social function - to maintain harmony amongst co-workers who would otherwise have no appropriate venue to vent or fraternise. Although dreaded by some, I tend to enjoy our work dinners immensely. It's free food and alcohol. Heather continues to be an extremely impressive mother. She is stalwart, steady and comforting. Our relationship has always been remarkably good, and only seems to be getting better. That may also be because I'm losing some of my unseasoned tendencies with age. May time continue to mellow the immature tannins of my personality. If I had to pass but one piece of advice onto the younger generation, it would be to work on making yourself good enough to deserve someone you admire. And our two kids continue to bring us much delight, albeit with much energy displacement. The best way to describe them in common terms would be two heavy, spongy, variably-smelling, jumping jellybeans of mischief and entertainment. Ashley is speaking a fair bit of Korean and a little broken English these days, while Alex emits random vocalisations from which meanings can be discerned by pitch and duration. As another new year dawns on us, I do wonder whether I'll be able to post more often, if not for the sake of tracking the rapid growth and development of my aggies. 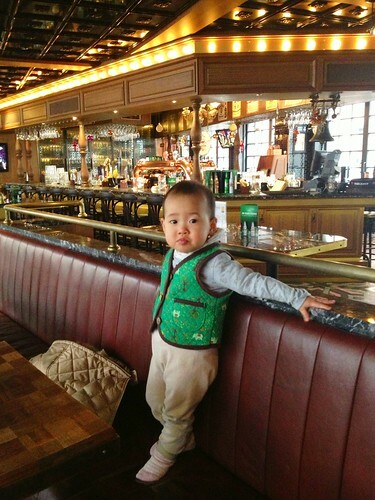 But then Lee's Korea Blog will inevitably become more of a Lee's Kids Blog. I am acutely aware of how uninteresting it can be reading about another person's kids. But what can you do. 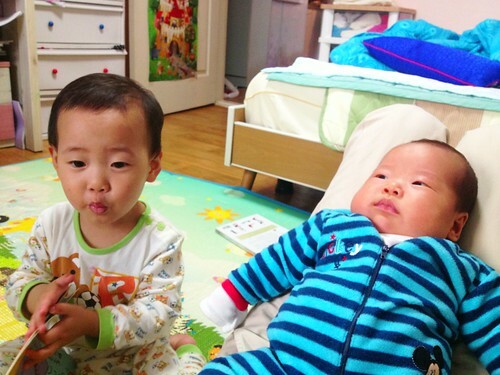 You are more than welcome to follow along if you are interested in seeing two little Korean kids grow longer bones and proportionally smaller heads. Wishing you a safe and prosperous 2015. One thing this old blogger likes to do is talk to himself in his head about how long it has been since he last posted. Aware that such mutterings can easily sow the early seeds of a number of druggable neurological disorders, we here at Lee's Korea Blog have decided to attempt a limited slash and burn at the overgrown jungle of as-yet unposted posts that need posting. Within the dusty cloistered catacomb-like vaults of my image archives, a substantial stash of pre-Alex photos await even the most basic of accompanying narratives. Unfortunately, I do not believe they are going to post themselves. 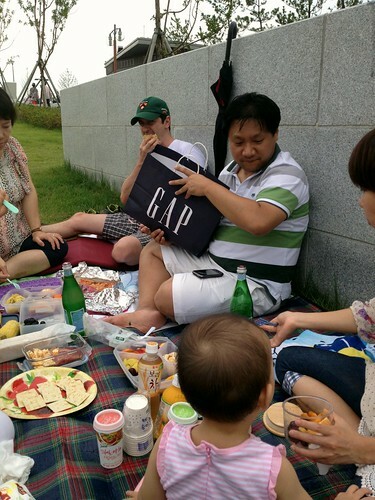 This photo was from a spontaneous picnic that occurred near Incheon, back in the day when the other members of the now-famous Couples with Kids Clan were yet to have their kids. Ashley was the first baby on the scene, and thus a center of interest and a considerable scoop for the Farrand family. 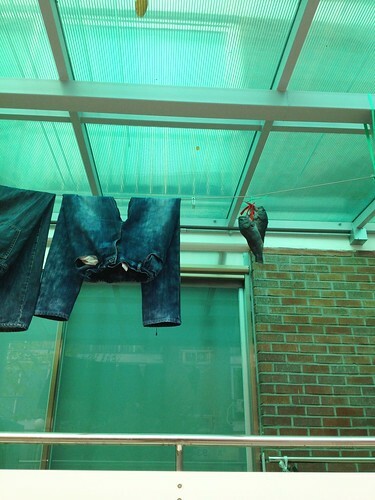 Here's a photo of some fish that our old neighbor's hung out to dry on their clothes line. As one does, when one is fond of dried fish. 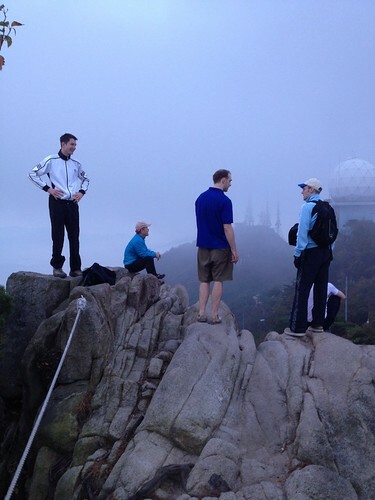 And incontiguity in storytelling aside, one early morning at around 5am, many moons ago, a mildly sleep-depraved band of SNU colleagues found themselves perched upon a mountain. 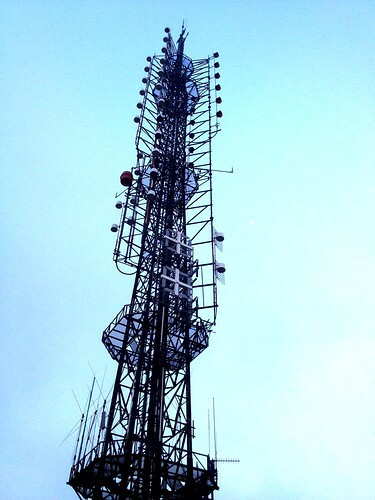 For what reason we chose to climb the mountain at such an unagreeable hour has since been distorted by hwesik myth and alcoholic recollection, but I seem to remember it had something to do with the topic of wolves. Of which there are none on the Korean peninsula. 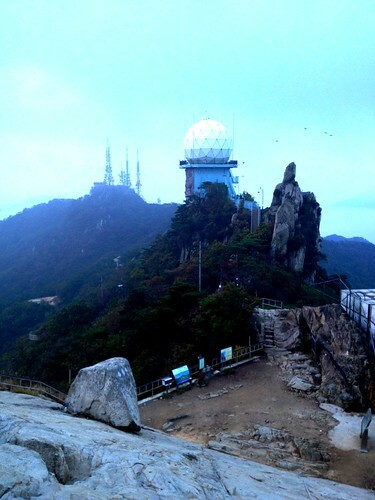 This rather stark geometric projection is a signal amplifier perched atop Gwanak Mountain. And here's Baengy learning how to poop atop a chambered pot. She went through a number of cycles, shunning the tall white structure and going back to her kiddy potty, only to triumphantly return to the throne and leave a sizeable deposit a few days later. The holding of her feet by Mother Farrand seems to put her more at ease. 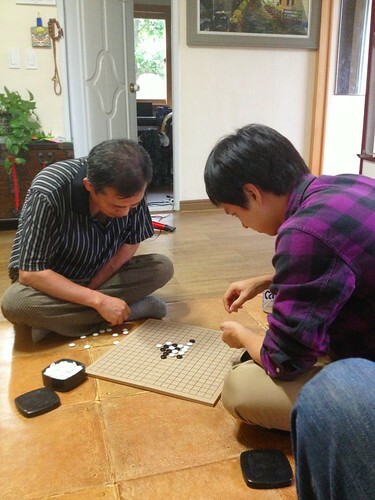 Here's Heather's father and brother consumed in a game of Go. Apparently there are more combinations of game outcomes in a game of Go than there are atoms in the universe. I have a rather boisterous friend who does not believe such claims, but it appears to be quite true. "The game complexity of Go is such that describing even elementary strategy fills many introductory books. In fact, numerical estimates show that the number of possible games of Go far exceeds the number of atoms in the observable universe. [nb 15]"
I don't quite know how we can get our heads around that one, but it's safe to say that humans have a very primitive grasp of exponentially large numbers. This photo is from a walk in the Geumjeongsan park near Heather's parent's house in Busan. Back in the golden days when Baengy still had no hair. When I was a boy, which in many ways I still feel I am, although by some metrics I guess I may not be, but anyway, questionable use of punctuation aside, when I was a much smaller boy, I remember very much being enamoured by all things biologically aquatic. 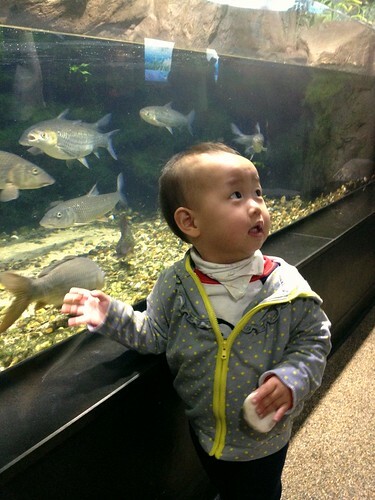 Guessing that such a strong impulse may have genetic origins, we took Baengy to the Coex Aquarium to observe the results. It soon became apparent to us that Baengy is scared of no fish. Fish larger than Baengy-size, next to the glass, with crooked razor-sharp teeth and mouths ajar like gaping wounds, received not even the slightest flinch from the unblinking eyes of our offspring. 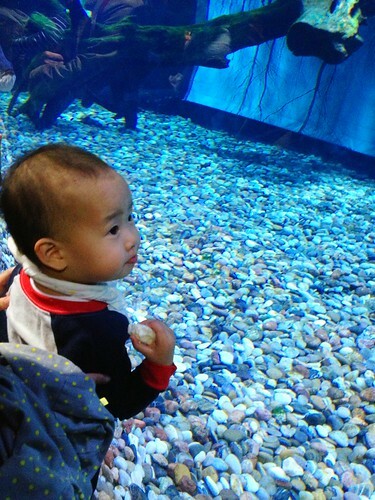 Although I am not entirely convinced that she knew we were standing next to aquariums with real fish, as opposed to large television screens. Our daughter knows what a camera phone is and has been observed to take the odd photo of herself from time to time. 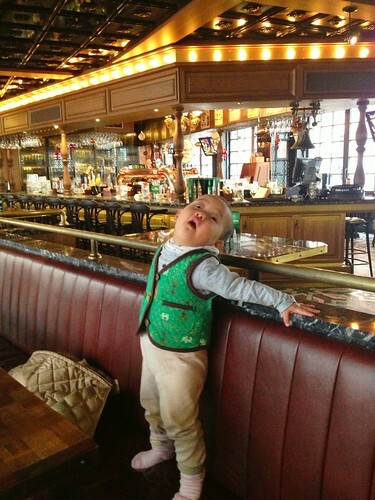 She has also learned the fine art of the sarcastic pose. She tends to make friends with people wherever she goes. 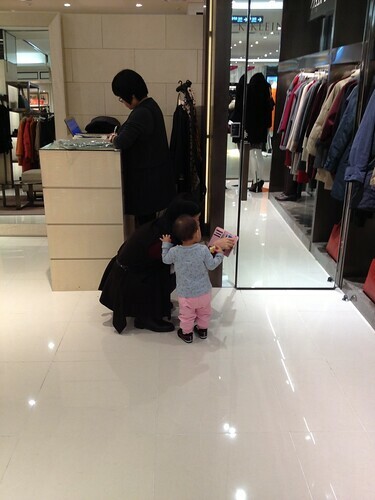 In the photo above, a shop assistant is showing her some phone apps. Baengy placing her hand on a stranger's shoulder means that they have been promoted to a fairly high status. Promotions tend to happen quickly when smartphones or sweets are involved. We spent a good deal of time teaching Baengy how to kiss properly. She knew that it had something to do with two sets of lips being brought within close proximity of each other. However, the coincident vacuum peck was not to be realised as a necessary addition until many months later. And we also noticed that she likes lids, to the extent that we soon found that any bottles or jars within arms reach were at risk of being thoroughly investigated and the contents strewn across the floor. So Mother Farrand decided to address the problem by manufacturing a 'lid sampler' with 3 different kinds of empty plastic bottles with lids immobilized onto an old shoe box. The amount of time Baengy has spent playing with this box of delights has both bewildered and pleasantly surprised us. So much for the electric piano and Fisher Price gear. And then we noticed that Baengy likes putting things in slots. So Mother Farrand cut a mailing slit into the same box, and we gave her some business cards to play around with. The device overall has kept Baengy occupied for hours on end. I guess the moral of this story is that a bit of creative thinking can keep your aggies occupied for extended periods of time. Baengy started to speak a few months ago. Her abilities have since improved dramatically and she can understand quite a lot now. 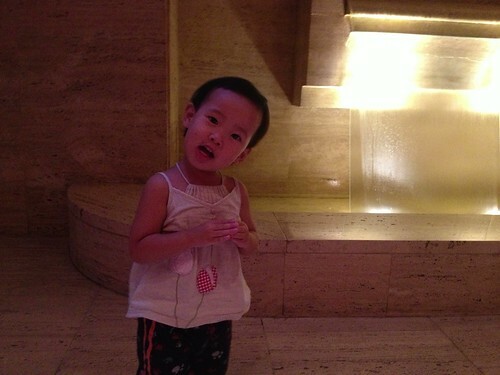 We mainly talk to her in Korean at the moment. It's not a conscious decision, but it seems more natural seeing as it's the language used at her daycare centre. My Korean is still terrible. Last year's winter was a bitterly cold affair in Seoul, with frozen roads lined with snowy slush. In the midst of its chilling depths, we decided it would be rather pleasant to go somewhere nice for a long weekend. Somewhere warm. A few mitigating factors hampered the immediate actualisation of our tropical escapade proposal. At the time, Baengy was not yet two years old and Heather was 6-months pregnant with Alex. I was in the final year of my PhD and our financial situation was not particularly sparkling. Call me paranoid, but I swear there was a muffled chortle whenever our bank book was handed back by our cashier. But despite our rather 'cute' bank balance, in the end we decided we needed to do what we needed to do. 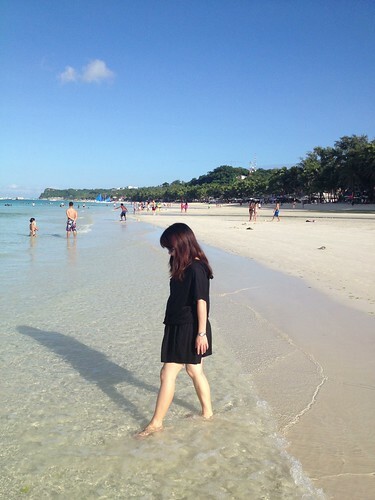 We placed Baengy in the care of diplomatically-delighted halmoni and halaboji in Busan, and went away for a long weekend to Boracay in the Philippines. It's a pleasant problem to have to untether a layered mass of cumbersome winter clothes at a foreign airport due to warm tropical weather. 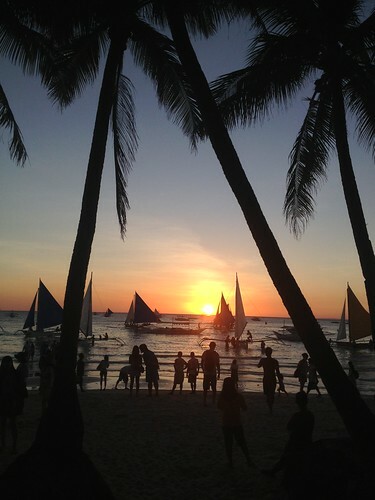 It seems that when the sun has all but forsaken the Korean peninsula, Boracay is where it comes to play. On the sandy beaches of South Australia, one can be forgiven for expecting the alluring waters to be hospitably warm. This can often be followed by a cold reality shock when dipping ones tootsies into the waters, on the other side of which are the Antarctic ice shelves. 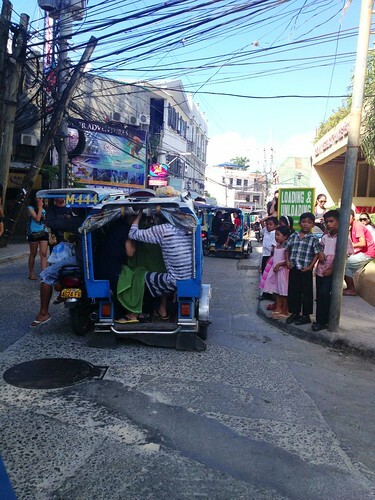 Not so, in Boracay. The waters here receive visitors with generous servings of jovial thermodynamic gravy. 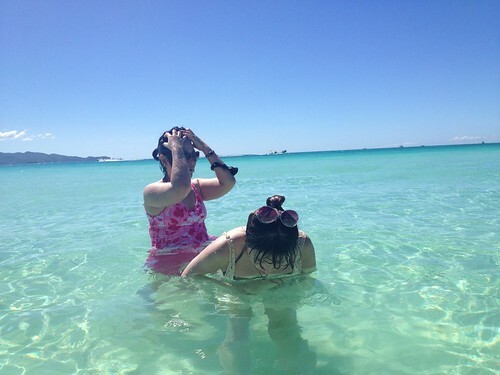 After leaving our baggage at the hotel, we promptly hopped into the warm waters with a moderate amount of childlike glee. There exist various desktop backgrounds on office computers around the world that depict idyllic sandy locations with glimmering turquoise waters. These are the places where our daydreams take us. But actually going to one feels a bit like visiting Disneyland, or being sucked into a Nintendo game. The sunsets were invariably spectacular, although brief, while the sands retained a soft warmth at dusk. Traveling with Heather is always an enjoyable experience. In my opinion, there are two types of fun travelers: those who enjoy suggesting interesting things to eat and do, and those who agree that such suggestions sound good. I'm of the former variety, while Heather is of the latter. 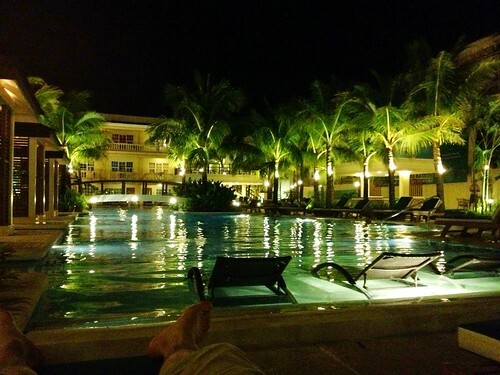 We stayed at the Boracay Garden Hotel, a fairly nice place with outdoor pools and decent cooking. Rooms were spacious and cost about $120 per night. Transport occurred from place to place in open hybrid vehicles of questionable safety, to which we held on tightly. Common sense is the most affordable type of traveler's insurance. 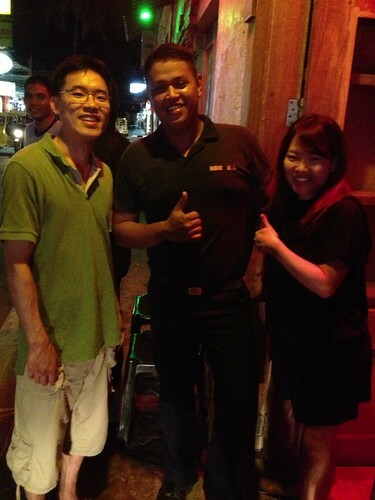 In the very first restaurant we ate at, we sat with Rani and Minseon, two other Koreans in our tour group. 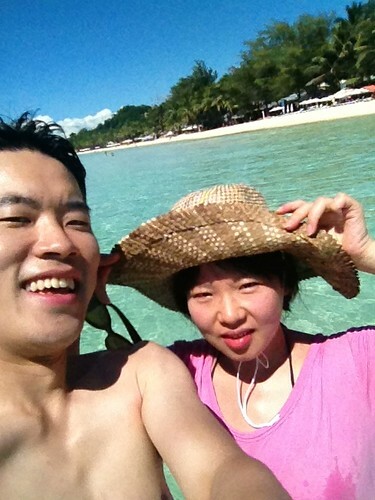 They work at the same company in the southern city of Gyeonju, and save money to travel together every few years. They're both married, although their husbands are not fond of traveling. We had some good conversations about life, the universe and everything, over bottles of Filipino beer and cheap fruity cocktails. 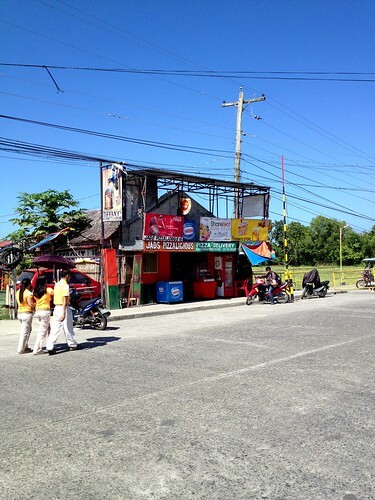 For a handful of Filipino pesos, you can rent a deck chair for a day. But the sun inconveniently moves in a wider arc across the sky the closer you are to the equator, necessitating an incessant shifting of chairs toward the elusive shade. 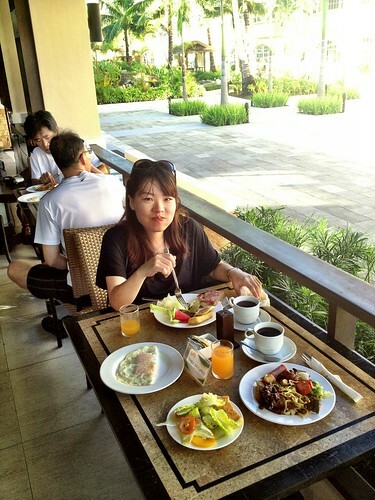 Good buffet breakfasts accompanied with strong coffee started each day off in the right direction. "More fresh mango juice, give you sir?" 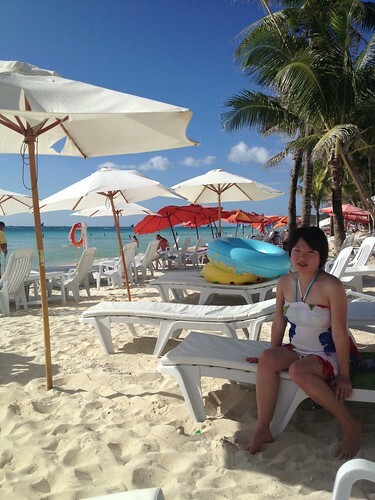 Our tour was run by a Korean company, and Boracay is very popular with Korean tourists. The benefit of joining the tour was in not having to figure out everything ourselves, from the reputations of local restaurants to the unsolicited offerings of jet ski rental from strangers. The down side of the tour was not being able to do things at our own pace, and having things explained to us as if we were from the dark side of Pluto. "This is a snorkel. You breathe in this end. This other end is the one that sticks out of the water and brings air in. You cannot breathe if both ends are underwater." 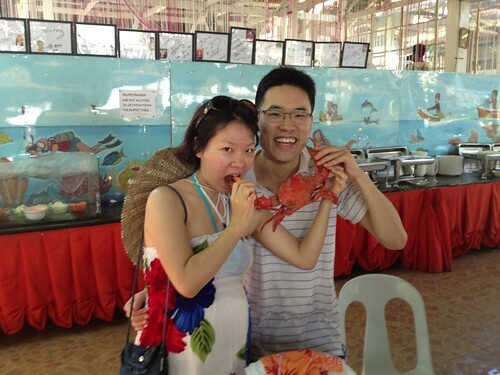 We went for a boat tour of the surrounding islands and feasted on crabs for lunch. I don't mind the odd crab now and again, but I find their hardened exoskeleton makes them a fuss to eat. I am more of the fish fillet persuasion. "Many men go fishing without realising it is not fish they seek." A quotation that came to mind, although on this particular occasion it was in fact fish we sought (and caught). 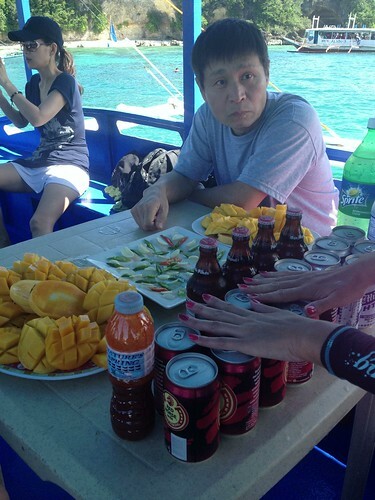 We enjoyed San Miguel and Red Horse beer on the boat, along with fresh mangoes and sliced sashimi from the fish we caught. The ajosshi at the table was quite a character. He brought a nice stash of smuggled bottles of soju in his luggage from Korea to share with everyone at dinner times. 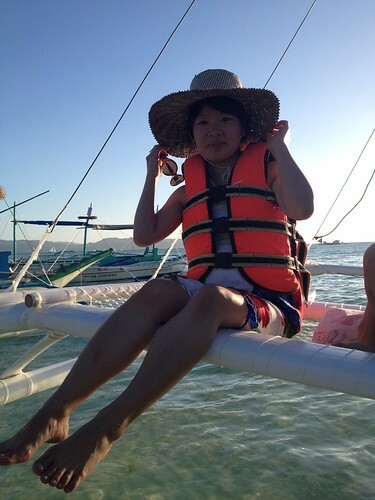 We also took a ride on a fast catamaran. It still amazes me how they can sail back and forth on the same route using the same breeze. The locals we met along our well-worn travel route were cheerful and accommodating. 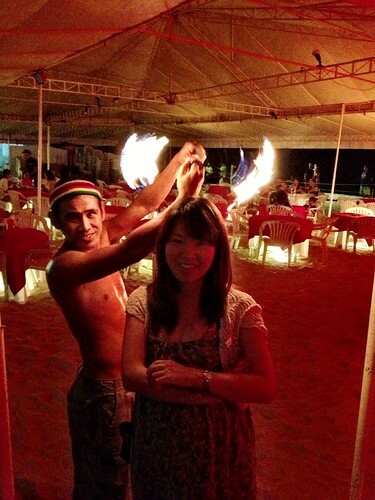 On the final night we went to a beachside club and had a rather merry time. All in all, it was an excellent holiday. Although we were worried whether we could afford it, in the end it felt like money well spent. 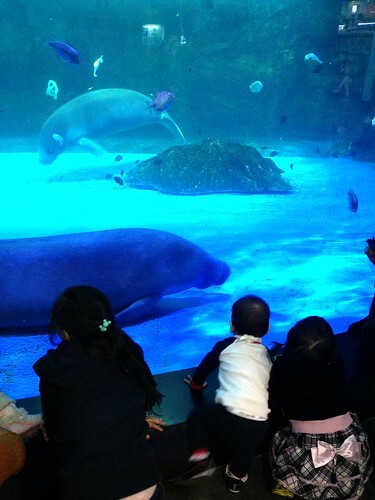 The great weather, warm waters and plentiful activities made it a destination worth visiting. 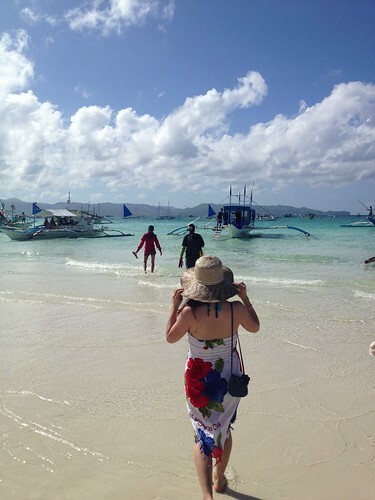 Everyone needs a holiday once in a while, and Boracay is a great place to have one. "Time and tide wait for no aggies*." With a distinct dull roar, the ongoings of the recent six months have whooshed past, and off into far distant horizons inhabited by a loose ecosystem of hazy memories unfortified by regular blogging. The cause of such a predicament, post mortem reveals, can be traced to a series of momentous overlapping life events that converged simultaneously for the perfect storm, all of which could only be accommodated within an inadequately small teacup of a schedule. But we have emerged unscathed. And dusted ourselves off to resume blogging with aggies conspicuously older than last seen. The first major event we dealt with was moving house, as our lease of the SNU family accommodation expired with the completion of my studies. The family mini-apartment we had at SNU on campus was excellent, although quite small for two boisterous babies who enjoy making a mess. We had two bedrooms, our own kitchen, bathroom and two balconies, subsidized to W150,000 per month. It had everything we needed, and made a significant impact on our ability to live comfortably in recent times. But the time had come to move. All constituents of the Farrand household were thus summoned to attend a Thing, during which the future direction of the household was decided upon. 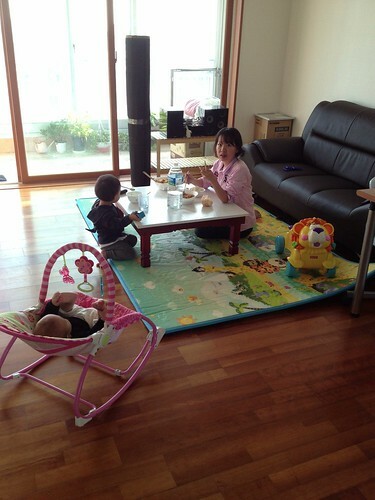 Finding accommodation for a family in Korea is no easy task. Families in the bigger cities here are like eager hermit crabs, dashing into recently vacated shells whenever an affordable apartment hits the market. Further complicating the matter is the arcane yet popular practice of jeonse, whereby large deposits (hundreds of thousands of dollars) are lent by the tenant to the landlord instead of regular rent being paid. The landlord is then free to invest the tenant's money during the period of the lease contract. We were faced with the choice of borrowing money from the bank to pay a large jeonse, which we would have had to pay interest on, or borrow an even larger amount of money and buy a house instead. We, of the Farrand tribe, do not take such decisions on a whim. Arguments were heard, opinions were raised and countless cups of tea imbibed. Eventually, a motion was put forward to go the full monty and borrow enough money to purchase our own abode. The end result of voting was 2 votes in favor, with one abstention and one unintelligible answer. 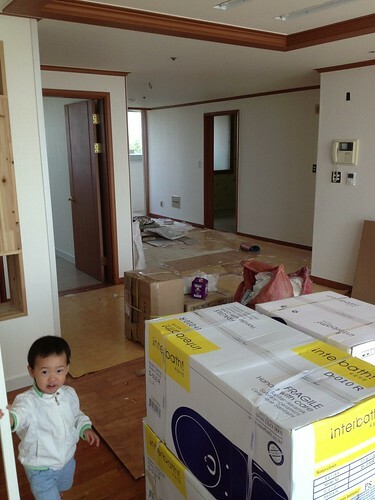 To make a long story short, we ended up buying a house through auction in Suji-Gu, which is about 40 minutes south of Seoul. As fortune would have it, someone (an investor) with lesser fortune had previously purchased a house using borrowed money, defaulted on it, and had it seized by the bank. Heather, being the incalculable genius that she is, managed to win a silent auction on it for only slightly higher than the reserve price. 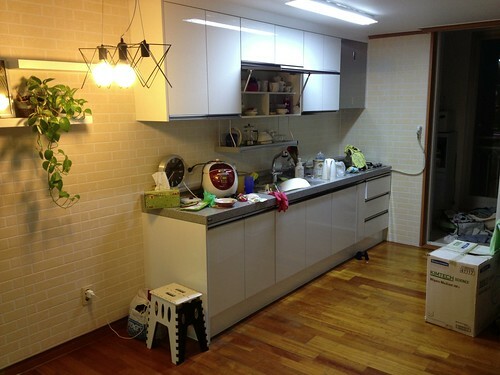 We bought our 31 pyeong apartment for W247,000,000 (approx AU$240,000) and spent some further money to remodel the interior. 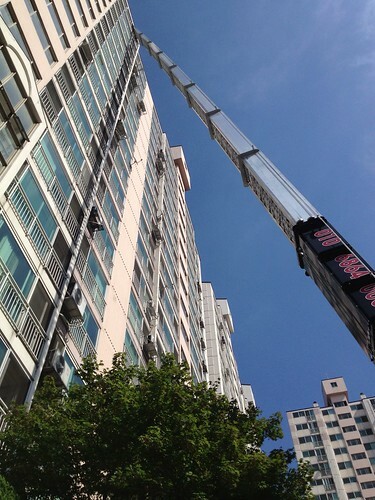 So we moved in at the end of August, an action that required an enormous skycrane to ferret our belongings high up into our new perch. Although it all sounds rather smooth, there were a number of obstacles. Luckily, I have a resilient partner who is also very good at solving all manner of problems. Although our old place was fairly crowded with furniture and belongings, our new place swallowed it all up with room to spare. Previously, whenever Baengy became excited, she would do a sort of hopping jump on the spot to release energy while not bumping into nearby walls in our old place. Now she runs all around our new apartment with glee. I think that simple fact makes all the money and effort worthwhile. 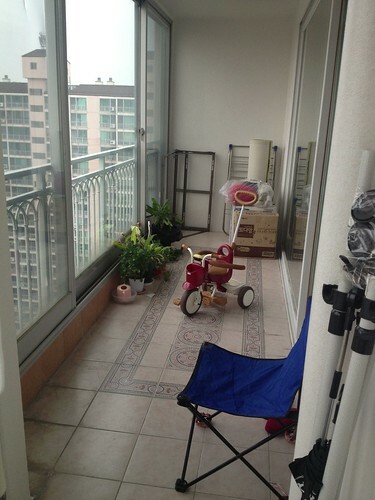 One of our new balconies. Heather also seems content, although we don't yet have all the furniture we'd like. Such things shall come, with the passage of time and the arrival of paydays. In our new kitchen, it's strange having so many things that work properly. Our previous gas stove was quite fickle and had to be ignited using a secret ritual involving a perfectly-timed flick of the wrist and a recited compliment. And our old faucet would leak for a while after being turned off. But everything in our new place has an eery efficiency to it. Alex is quite a joy to watch growing up, even by baby standards. He smells like fairy floss and likes his big sister a lot. Big sister exhibits an amusing blend of tolerance and ambivalence toward his frequently outstretched and grasping hands. They both like books, sent to them by Grandad Kym and Grandma Mary, and read to them by Mother Farrand. Baengy has already learned the English alphabet. My new job is going well, which I will talk about in more deserving detail in the near future. One of the most noticeable things that's happened since graduation is that I now have more spare time. I joined the Australian Chamber of Commerce recently, and we've attended some of their events. 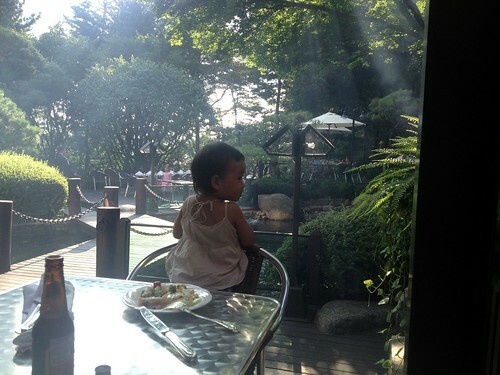 These photos are from a barbecue they held at a hotel in Seoul. Baengy knows what cameras are and what to do when faced with a lens. 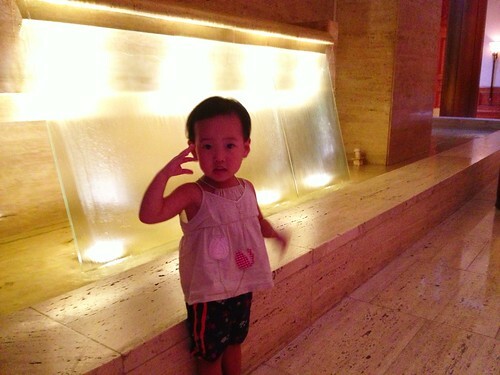 One of the funny things she does though, is talk to the person she's posing for, in babytalk. I've managed to keep taking photos in regular intervals over the past few months, although I haven't kept up with the blogging. I've decided that I'll put as many of the good photos up that I can, over time, even if the chronological order is a bit dodgy. I think we, the Farrand family of Korea, are in a lucky situation now, with a future to be looked forward to. And Ashley and Alex are both growing up at breakneck speed. I'll try to keep up my end of the bargain and continue taking photos, and hope the memories won't be forgotten.